Contagious molluscum is a viral disease transmitted by contact-household. The name of the disease is due to the characteristic symptoms – when you extrude the contents of the pimples stands out thick whitish mass with the inclusion of clamobratnykh Taurus. Surgical tweezers, iodine, UV light, garlic, acyclovir, retin A"
Diagnosis. Primary diagnosis is based on clinical picture, however, to exclude diseases such as warts, lichen planus, epithelioma and multiple keratoacanthoma, histological study of the cells of the epidermis. The presence in these cells of a molluskoriented Taurus allows to confirm the diagnosis "the contagious molluscum". Due to the fact that the virus molluscum contagiosumand has a built-in DNA, its complete destruction impossible. The basic steps in the treatment of contagious molluskand is aimed at improving immunity. In mild course of the disease initially healthy body is able to cope with the infection within six months. To accelerate the treatment, depending on severity of symptoms, specialists can offer several types of treatment contagious molluscum. 1. Mechanical scraping or squeezing the contents of the nodules, followed by "burning" the cleaned surface a 5% solution of iodine or a strong solution of potassium permanganate. The procedure is performed in outpatient conditions with full compliance with the rules of asepsis and antisepsis. 2. Electrocoagulation – cauterization of nodular formations using the electrocoagulator with subsequent exposure of the skin to ultraviolet light. 3. Treatment of the affected areas of the skin ointments with anti-viral such as acyclovir, retin A, cheap. Effective lubrication knots fresh juice of garlic. This treatment is carried out at home after histological examination. The self is not allowed because the contagious molluscum can be confused with several benign or malignant diseases. 4. In generalized form of the disease, when there is no possibility to clear all the knots because of their large number, recommended the appointment of antibiotics of tetracycline group. It is possible to use cryotherapy. This method allows you to remove the rash with dry ice or liquid nitrogen.During the period of treatment required medical supervision by a dermatologist. 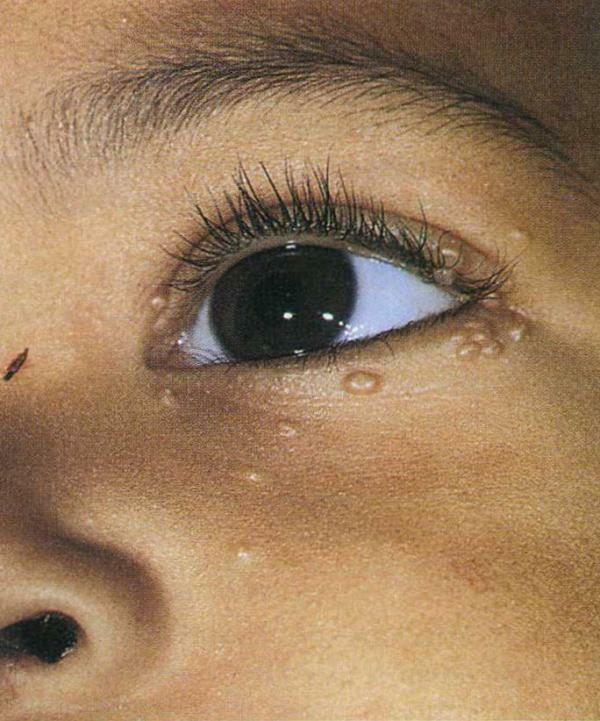 Note that in the acute stage molluscum contagiosum is a contraindication for sexual activity. In addition, children who have this disease, should not visit kindergartens and schools to complete disappearance of the external manifestations. The main emphasis in the treatment of molluscum contagiosum should be done to improve immunity.